There are most likely as many ways to achieve a beautiful B&W look as there are photographers. Maybe I am exaggerating it a little, but then I am in love with B&W. It is not as if I don’t like colour, oh no. It’s just that I like the “classic” look that much. So today, instead of doing some general article on B&W conversion and trying to cover several different looks, I am going to pick out a photograph and just work on it until it is exactly how I pre-visualized it a second before pressing that shutter. First of all, though, we need a photograph. I think I have just the right one. Low-contrast photography is not everyone’s cup of tea, so to speak. In fact, a lot of people will absolutely hate it, because, well, it’s not really what you’d call the popular choice – many think that low-contrast means lacking in contrast or associate it with flat. Some also believe that the more contrast there is, the better. It is fair to say that low-contrast photographs are nowhere near as eye-catching as the high-contrast B&W photographs you’ve certainly seen before. That does not make them in any way inferior. So if that is your thing, low-contrast images seem somehow under-processed to you and you feel you might get irritated by a different opinion, the best advice I can give you is to skip this article altogether and wait for the next one that will cover a different sort of conversion with a different sort of subject and mood, too. Also note that the conversion I chose in this case is extremely subtle and the actual difference you are going to see depends immensely on both your taste in B&W photography as well as your monitor calibration. There are so many ways to convert images to B&W, this isn’t even a scratch on the surface, barely a drop of water in the ocean. At that, it is also really very simple and does not involve anything remotely complex. That was the intention. The end result is far from something you would see on the cover of a magazine, but then, not everything should be suitable for that. With that in mind, let’s take a look at the photograph I chose to work on. The image you see above is almost as it came straight out of camera. It was taken with my trusty Nikon D700, the versatile 50mm f/1.4 lens at f/1.4, ISO 200 and shutter speed of 1/320th of a second. The only changes that I did make before taking the screenshots are the changes that I always start with – lens correction to counter any slight distortion there was as well as quite significant vignetting (something I rarely do, but because of the composition it was not working well for this image), my default sharpening settings (Amount: 75; Radius: 1,3; the rest at their default Lightroom values), and White Balance. And while the portrait might look just about presentable as is, it is not what I saw through the viewfinder. This is, or at least as close as I managed. As I’e mentioned before and as you will notice straight away, this is not your regular magazine look – the bride’s skin is not pearl white, her hair is not pitch black and the photograph itself is not super contrasty. In fact, there is no black in the image at all, just very dark grey. And, quite obviously, not everyone will like such a look, it might seem too flat at first, before the eye gets used to it. Right now, I do. I find it… more subtle, with more emphasis not on the luminance, but on the light and how it bathes the subject. In a couple of years I will almost certainly no longer like it, but then that is how growth works. If you, like me, do like the look, I have some good news for you. It is very easy to achieve and straight away there are two choices. 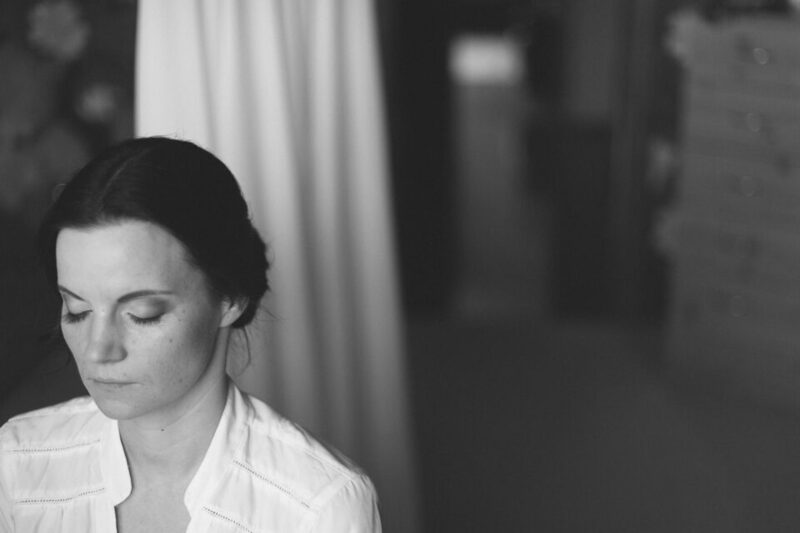 The first one – and the one I choose more often than not – is to use VSCO’s original film pack. Eight times out of ten the Ilford HP5+ preset is exactly what I want (and it’s my favourite B&W film, too) with just one or two minor tweaks. It’s how I see. The second way to do it is manually and whilst it does take a little longer than just selecting a preset, it’s not really what I’d call complex. So how about we start? A side note: you will also notice I did not do any retouching/airbrushing. Not because I am lazy, mind you. There is a good reason for that, but that is a whole different subject to discuss. Sometime soon, perhaps. For someone who is a little bit less picky than I am this is already very close to the final result. But then I am picky, so let’s move on to the next step. A side note: to learn more about such Tone Curve adjustment and some of my reasons behind it, read our “That Classic Vintage Look” article where I explain it in a bit more detail. Before I applied Exposure slider adjustment, overall I found the image to be a little too bright, save for one particular area – the bride’s face, which was more or less how I wanted. After dialing in -0.20 Exposure, the whole image got “darker” as I wanted it to, but so did the bride’s face. With this step, I am going to lighten it up a little again. This “more local” adjustment, in a somewhat peculiar way, involves working with colour. What I am interested in is the skin tones which consist of a some red, yellow (perhaps most of all) and orange colour. Since the brightness of the bride’s face is almost as I want it, the adjustment is going to be very subtle and done in the B&W section of the HSL/Color/B&W Tab (because of my initial conversion to B&W choice). You can see the changes that I’ve made on the left, it was enough to lighten the bride’s skin just enough. Were I not as happy with some of the other tones in the image, I’d have had to adjust more sliders, but as it is I found nothing distracting enough to be worth toning down and risk potentially compromising the smoothness of tones, which would require further fixing. Now that the overall contrast, tonality and exposure of the image is how I want it, time to subtly increase the prominence of some of the bride’s facial features by emphasizing the shadows. Two simple ways to achieve that – use either the Radial Filter tool, the Adjustment Brush or both. For me, I thought I’d go with Radial Filter tool alone this time. Because I am going for a low-contrast look, the adjustment is, again, extremely subtle and involves just two settings within the tool – Shadows, which I set to -21 so as to make them slightly darker, and Clarity, which I set to +17 to emphasize the shadows further as well as make her eyelashes somewhat more prominent. I also marked the Invert Mask checkbox so that the changes take place inside the selection and not outside of it. Applying Clarity has also emphasized what you might call “skin imperfections”, but in this particular case I did not find that objectionable (not to mention that her husband would most likely call them facial features and, as they are part of her, it is also something he almost certainly loves). In any case, I am not a fan of the “plastic look” and the soft window light itself has done enough to smooth her skin. And so I am done with the adjustments. Naturally, the settings that I specified, I did not select them at first try – there was a lot more adjustment involved before I settled down with the numbers and choices that you saw described. The best way for me to check whether I liked the progress I was making or not, and whether I liked the final look, was to use Lightroom’s Lights Out mode. With Lights Out, Lightroom allows you to dim or completely turn off all elements of the program except for the image itself for preview purposes (press “L” to go to “Lights Dim” or “Lights Off” modes). I set my Lights Out color to white. This lets me preview the image in a black background when in normal working environment (Lights On) and see how it looks in a white one when I choose the “Lights Dim” or “Lights Off” viewing modes. A side note: if you are yet unfamiliar with Lights Out viewing mode and would like to set it up, you’ll find the necessary settings in Interface Preferences dialogue which I covered in this article. I hope you found the article useful. If this sort of B&W conversion is not to your taste, however, don’t be disappointed – perhaps you will find what you’re looking for in our article on high-contrast B&W conversion. I really like your recent contributions of this kind on B&W photography and post-production. I think they are very well written and to the point. I do not really agree with you that the characteristic of (all) vintage B&W photography on film and in prints was the lack of pure whites and true blacks. I have worked with film in the past (35-40 years ago). My goto film at the time was Kodak Tri-X, exposed for 800 ASA/30 DIN (or in present figures 800 ISO) and developed in Promicrol. Landscape images from camera with yellow, orange or red filters to darken the sky and increase contrast. Prints would be contrasty, grainy and “hard”, with true blacks and pure whites. A really different approach but at the time really popular too. Not at all an approach for all black & white photography. But well suited for specific landscape shots. did I somewhere say that all B&W film lacks deep blacks and bright whites? Because if I did, my mistake – that is of course not true, perhaps more so with the blacks than whites as the latter could really be only as white as the paper itself was. I only intended to point out that at the same time (in the past) there was that type of very contrasty photography, not only the “dreamy” and greyish kind. then I did not mean to say it that way, certainly. :) But even the contrasty work looks somewhat different from how modern contrast is used, wouldn’t you agree? these 2 articles (both 9/26 postings) have been especially enjoyable for me. very informative and enlightening in regards to your preferences/aestethics. good job! keep them coming. i really appreciate your site. These look really, really great. Well done! I never use Lightroom for my B&W development (I still find that I get closer to what I want and to my vision via Nik’s plugins, converting colour to B&W in there), but I must say, your B&Ws here are making me wonder if I still need to if I’m going for a lower contrast result. Well I look forward to that article, then. Personally, I like loads of contrast in my B&W shots. It comes from shooting with Kodak TRI-X 400 pushed two stops for many, many years, I think. I simply love contrast in my B&W shots. That said, there is a time and a place for low-contrast, low-key B&W photographs, and it’s nice to see first-hand how to accomplish this in Lightroom, which for me, is always a good thing: Photoshop, although essential to my work a lot of the time, is really a drag on my computer’s resources and hard drive space. Yes I certainly agree with that. But then more so (very different now) in colour photography than in B&W photography. I do however think that part of the difference is in the way we view pictures these days (on screen) and also because of the fact that vintage prints and books also lack contrast as a result of bleached colours through the course of time. I don’t really think vintage photo’s that we think dreamy now were always meant to be that way. So I think there is some degree of difference that can be accounted for so to say. Every process has its place in photography and art. In the end it is all comes down to what you or your client enjoys to look at. and thank’s for a really informative article how to do this “dowcontrasting” in Lightroom. I love the result of your work on this image. In these kind of photos/objects I also go for a lower contrast than “average”, but not seldom also in colour photos, especially from nature. I think it’s the way my eyes and brain sees the image. I often get comments on too low contrast and low saturation, specially from my daughter in law, who for several years used to be a professional colorist. One problem though! Monitors and TV sets basically can’t show real black, so setting down the black might be a problem when the image is shown on a average monitor. It could look too “flat”! Prints is another story. 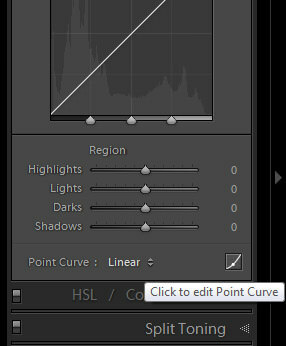 I’m looking forward to more informative articles of this kind – “How to xxxxx” – with Lightroom. I may have a solution to your problem RE: monitors not able to show real black: forget what your eyes see and go with the actual numerical values. 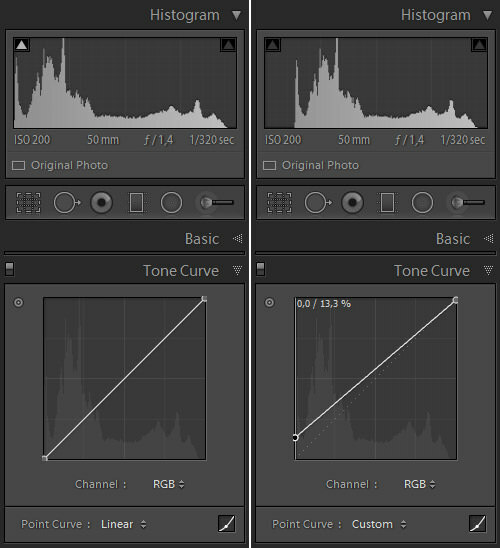 This could be accomplished by holding down the Alt (Windows) / Option (Mac) key while dragging the Exposure, Highlights, Whites, Shadows or Blacks sliders in Lightroom, and in particular, the Blacks slider, to set your true black points before adjusting the tone curve. When you hold Alt/Option and drag any of these sliders you will see any areas where values get clipped as a result of the adjustment: the colours which eventually show up as you drag the slider left (to make darker) or right (to make brighter) will represent which channel is being clipped; and when you adjust Shadows and Blacks in particular, the white areas of the image represent those areas of the photograph that are not clipped, and where black that increasingly shows up as you move the slider left, represents areas of the image with a total loss of detail (i.e. true black). Please, if anyone thinks this is wrong, correct me on this. I use this Alt/Option function all the time in my preliminary edits, to first set a true black and white point in my image, taking the sliders just far enough to see a tiny bit of clipping, but I could see using it in relation to tone curve adjustments where one isn’t certain where true black really is. Another, manual option would be to move your cursor around the darkest areas of your image and note the numerical values in the histogram at the top of the Development module in Lightroom, to ensure there are some 0 (zero) values, and then set percentages of grey in the tone curve as Romanas notes, to create replicable fading in your images. Being a new user to Lightroom, I found this article very helpful. Thank you. Lovely post romanas. My portraits always seem short on proper lighting. Maybe thats cus i mostly use ambient light. I find it very satisfying to get a proper exposure with low ambient light. Maybe my d5100 is just very good at low light stuff. Other people always seem to get properly lit portraits. Maybe thats cus they use flash. But when i use flash it lights the subject unevenly. The cheek bone area becomes shiny and the rest a little underexposed when i take reallyclose shots. I would like some help with spreading the light evenly. Very nice to read that I am not the only one that find most photographs too contrasty. This is in my perception often the “digital feeling” that I don’t like. Hopefully one day there will be more attention here for working with Capture one (although it is easy to “translate” your tips). Love the shot! But I must say, I’m left wondering: is the bride just pausing, shutting her eyes for a brief minute. Is she doing something with her hands? Otherwise, I love this kind of B&W. I have a few of OnOne’s presets for B&W, but having heard more and more about Silver Efex, I’ll be checking them out as well. For what it’s worth, I’ve been using Silver Efex for many years now. I’ve tried the offerings from other companies along the way, and I’ve experimented a lot within Lightroom as well, but nothing seems to give me the results I am looking for aside from Silver Efex. They seem to have pretty much nailed it. And depending on your workflow, you can use it within Photoshop, too, and have access to brushes in addition to the native Control Points that the programme utilises. Very handy! I have all of Nik’s software (it comes bundled now from Google), but I don’t much use the other programmes all that much — only Silver Efex. If you can swing the cost, I think you’ll be really happy with the way it converts B&W. I even think the grain that it adds (optionally) looks pretty organic as well. Well, I think you have that right; Silver Efex has it for B&W. Was taking a look at their site, and I am impressed. I’m not one to be too hip on downloading a bunch of presets for this, that and the other. I’m still at the stage where, as an amateur photographer, not shooting a gazillion photos a year, I like doing most of my adjustments in LR by hand, with just a few home-made presets. But when you come across software that gives you more enhancement of what LR can do, that’s always worth paying attention to. I’ll tell you, though, right now I’m trying to find free, or really cheap, software that has stitching, layers, composite ability (to deal with dynamic range issues), and enhanced spot removal and cloning. I can’t afford Photoshop and I don’t want to pay monthly for it. GIMP seems to be the runner up, but many of the reviews I read say it’s got a difficult learning curve. Eee gads! When does it end! So, down the road, I’d like to invest in Silver Efex, but my next project is to find software that will enable me to do those tasks that LR can’t do. I have had a long-standing inquiry I have been making of the creation of B&W images from color ones, Raw and even JPG. I have used Light Room, NIK’s Silver Efex (which I have as an application in my PSE), and PSE. I would be most interested in providing you an image I took several days ago of a train entering a cut–in-the-rocks to see what you would do with it in Light Room and compare that to what I have done in PSE. (By PSE I mean Photoshop Elements – I am simply too poor to afford Photoshop and have somewhat of a paranoid of going the Cloud route that Adobe has made available, primarily because I often find myself in places for which there is no connection-to-the-WWW. Pre-visualization… that is the key to this photo. I miss film. I loved Panatonic X (and was devastated when Kodak discontinued this great 32 ISO b&w film decades ago) & mostly developed in HC110 with specific dilutions depending upon lighting conditions.) This film had incredible tonal range and could give you the soft look or a very contrasty look, depending upon development of both negative and print. Tri-X became my favorite b&w film (shot at ASA 200 developed mostly in D-76 at 1:1 with different times (and on occasion dilutions) depending upon the light I was shooting in and my pre-visualization. And last, I used TMax-100 which I liked much more than the other T-Max films…. Speaking of pre-visualization. No matter how much one pre-visualizes a photo, there is always a bit of a surprise once the first test prints occurred. We b& photographers owe a lot to Ansel Adams and his ground breaking work on the negative and print. I always tested for D-Max in the darkroom. At least with film there was an incredible surprise upon contact printing and then doing some test strips, but even with digital there is an amazing amount of surprise once I import the photos, even after immediately viewing the shot in camera. Have you tried Capture One Pro 8 with b&w? I feel that Capture One’s RAW processing algorithms have a bit more subtlety to them and a better dynamic and tonal range upon RAW processing than LR – and for me, that is why I am experimenting with CO and thinking of switching from LR. 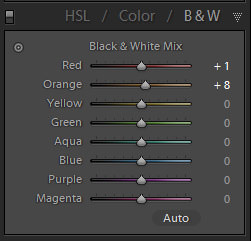 Their sliders work totally different than Lightroom sliders; and CO does not have as many sliders as LR does in its Basic and Tone Curve sections. Nor does it have as many adjustment filters. However, it does have a great layer system where one can make very accurate changes to small areas of the photo. The learning curve for CO at first appeared to be daunting, but like LR, once you got into it, it’s not that difficult. As other readers have commented, NIK software, especially Silver Efex, is incredible. I just hate having to convert to TIFF files, but I should probably use it more often….. I realize I’m late to the party on this one…. Thanks for posting on this subject. I’m on a long journey to improve my B&W images. After searching extensively (Fraser, Schewe, Ming, etc etc), I’ve come to realize there isn’t a “correct” method – whatever gets you to a desired result (although I’m sure there are wrong or inefficient approaches from a technical standpoint). I like low contrast images in certain situations – sometimes subject, lighting, and composition point you in that direction. Not a universal answer – just as a high contrast full tilt saturation image isn’t the answer for every situation either….. Very well executed….. I think and shoot in Monochrome…. Much like the “organic” reference as that is what I feel using Silver Efex Pro until that certain feel…. you nailed with Organic…. Black and white are extremes of the light phenomena, that in photography becomes idealizations like the line or the circle. Rubens painted around 20 different blacks for example, all of them product of different “emotions” of blacks. The same happens with white. Even the most white paper is no white, it bounces a complex sources of light, but the brain makes adjustments and look for a word. Pure white and black are exception phenomenas in Nature.